Rather than sleep in on Monday, Josh Hanley bundled up and boarded a bus to North Hills to care for abandoned animals. Similarly, Courtney Noeth and Michelle Hayner stitched patches of old T-shirts together to make blankets. The trio joined about 650 students who braved below-freezing temperatues to spend their day off from classes volunteering around Pittsburgh. Similar in structure to the fall semester’s Pitt Make a Difference Day, PittServes’ Dr. Martin Luther King Jr. Day of Service focuses on King’s legacy of activism. Pitt students and alumni volunteered to complete 25 off-campus projects and nine on-campus projects from 8:30 a.m. to 2:30 p.m. Monday. Volunteers met early Monday morning to either board busses to sites around Allegheny County or set up in the William Pitt Union. Hanley, a first-year history and political science major, along with 40 other students, traveled from the Union to North Hills’ Animal Friends to pet and care for abandoned animals. PittServes Director Misti McKeehen said PittServes approaches service by asking what the community needs rather than making assumptions. McKeehen said King’s insistence that anyone can serve their community inspired PittServes’ MLK Day of Service. PittServes harnessed King’s sentiment by organizing accessible service projects for students and alumni who couldn’t make it off campus. “Everything that we have on campus today is stuff you can easily do in your residence hall or in your apartment,” McKeehen said. Noeth and Hayner, both sophomore neuroscience majors, took advantage of the on-campus options after the two saw a poster for MLK Day of Service. Hayner sewed quilts for Pittsburgh’s homeless with Noeth. She said making the quilts helped her appreciate her own privileges, such as having a home and staying warm through the 12-degree days like Monday. “It’s freezing. This winter, you don’t realize how lucky you are in your warm dorm,” Hayner said. After a cold day serving the city, volunteers gathered in the Union Ballroom to reflect on their day of service. As they munched on donuts and pizza, they thawed from the cold and discussed their experiences in relation to King’s legacy. Zheng, who led a group of eight students to Wilkinsburg to take down Christmas decorations, said his group pushed through even though they were working with water in freezing conditions. According to McKeehen, the reflection session is geared toward helping students understand the purpose of service, especially when it’s inconvenient. Though it isn’t as big as the annual Pitt Make a Difference Day — which takes place in the fall semester — McKeehen said MLK Day of Service had a great turnout. 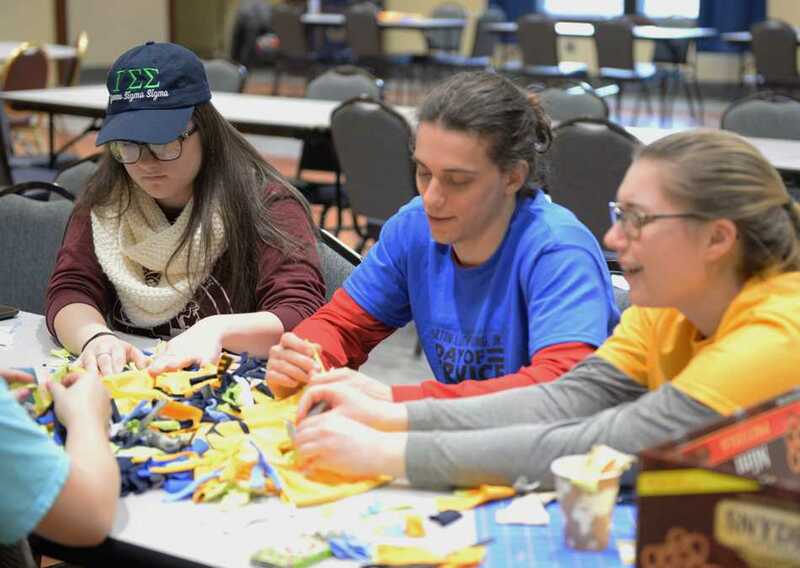 With ample volunteers this year and nearly 800 participants last year, McKeehen said MLK Day of Service is indicative of the convergence of King’s impact and the Pitt community. Correction: An earlier version of this story misattributed a quote to Courtney Noeth. Michelle Hayner was the person who said the quote. The story has been updated to reflect this change.